In my work as a Veterinary Surgeon dealing 85% of the time with birds, especially Parrots, I am frequently asked my advice on the purchase of a pet Parrot. Furthermore, many of the disease problems I encounter are the direct result of an unwise purchase, or of naivety in bird management. I therefore felt that a few thoughts on the acquiring of a new bird could be valuable for new members of the Society, or those moving into Parrot keeping for the first time. Parrots of all types are attractive and rewarding birds to keep, but the requirements for their management and the demands made on their owners can be very different from those of other birds or livestock. They are highly intelligent, and therefore easily bored; they can be both noisy and destructive; and the larger breeds have a potentially long life span. It is therefore important to be sure that you really want a parrot and can offer the necessary commitment to its upkeep before plunging into purchase. In other words, never buy on impulse. First of all, consider your own requirements. Do you want a single pet bird as a companion, that will reward you with endless hours of fun and enjoyment watching its antics and listening to its remarkable talking abilities? Or do you perhaps want a small variety of parrots in indoor cages or aviaries, that will keep each other company and make an attractive collection? They may even breed given the right conditions. Please do not try to choose your pet to match the decor, or worse still go to the extremes of one gentleman that I saw spend two hours looking round the display of cages at a Bird Centre, leafing through catalogues and talking to staff. He was looking for a particular ornate stylish cage that he thought would look well in his living room, and only then having chosen the cage did he even consider the apparent afterthought of what sort of bird may be suitable to go in it! You may want to progress to the keeping of Parrots outdoors in aviaries or specialist houses with the hope of breeding these birds. You could opt for 'near natural' aviaries with flights open to the elements, or go to the opposite extreme with closed and secure purpose-built housing with internally controlled lighting, heating, humidity, and ventilation. Both these require time, space and considerable financial resources. Be warned - parrot keeping is a disease! - I have met many clients who have started with one or two small pet birds, and have rapidly progressed to keeping more and larger species, and have eventually had to move to accommodate their growing collection. If you seriously intend to keep larger parrots with the intention of breeding them, I would submit that those people who have first kept and reared smaller species such as budgerigars, cockatiels, and grass parakeets are likely to be more successful than those that jump straight into keeping large birds. There are many mistakes to be made and lessons to be learned in aviculture, especially if one moves on to incubation and hand-rearing, and mistakes made with larger parrots can be very expensive lessons. It is far better to gain experience of the pitfalls first with the easier and cheaper species. These remarks are in no way intended to belittle the efforts of the thousands of bird keepers who successfully keep and breed such species, most of whom are incredibly knowledgeable about their stock; it is purely common sense in that if losses are to occur, it is better to start with birds that can be replaced with a few tens of pounds, rather than to lose a parrot that could have cost several thousand pounds. Having decided what sort of parrot keeping you wish to do, next consider your environment and lifestyle to see if they will suit your birds. All birds require space to exercise and spread their wings, and obviously the larger the bird the bigger will have to be the necessary cage or aviary, and the more birds you have the more living area will be required. An apparently obvious fact, but something that people don't always seem to consider. If you expect to have your pet out of its cage at times on a stand or even free flying, think of all the possible hazards to the bird such as other animals, fires, children, house plants that could be poisonous, cookers, doors, windows and the like. Conversely, consider the damage the bird could do to your home in chewing woodwork, wallpaper, plants or knocking down precious ornaments! 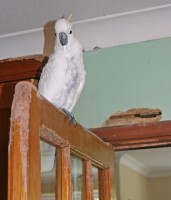 Think also of your neighbours - large parrots, especially Amazons and Cockatoos, are very noisy. Their twice daily periods of vocalization at dawn and early evening can be a joy to hear to those who love birds and appreciate that they are merely expressing their health and happiness, but it can be a great strain on a relationship with your neighbours. Thus if you live in terraced or semi-detached suburbia, your choice of bird may have to be very different to what you could have if you live in a detached property in acres of land. One must also accept the fact that indoor birds will want to join in with their 'singing' when you plug in the vacuum cleaner, or settle down to watch television! As I mentioned earlier, parrots are highly intelligent creatures, and as such require a lot of both mental and physical stimulation. It is therefore important to consider how much time you have available to spend with your bird(s). A single pet tame bird will require a lot of human contact, and a busy family household where there is activity much of the time is likely to be better for it than a lonely existence with a single person who spends all day at work. If the bird is left it should be provided with safe toys to play with - these need be nothing more complex than a papier-mache egg box or a block of hard wood, and a radio should be left playing. If one is regularly out for long periods, then it is probably better to have two or three birds together for companionship. At the other end of the scale, if you have several aviaries of breeding birds, the time taken to feed and properly care for them can be considerable. One has to ensure that this can be accommodated, plus the special arrangements that will be needed to cover absence for holidays or illness. Yet another important factor in your choice of bird is expense - how much money do you have available or are willing to spend not only on the bird but also on the necessary accessories such as food and housing? We have several times met people who will happily spend hundreds of pounds on the bird of their choice, but then will baulk at paying a reasonable price to get it a decent cage, or even will not buy a padlock to secure the door of its aviary! 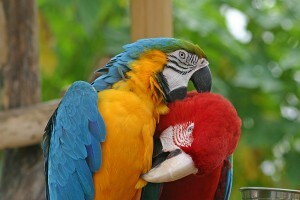 Parrots are not cheap pets, and the rapid rise in prices of recent years shows no sign of slowing down. Legal importation has now ceased, while the popularity of parrot keeping has increased, and like anything that acquires a scarcity value the parrot immediately commands a higher price. The keeping of several parrots with their associated housing can easily run into an investment of several thousand pounds. We still have not yet gone out to buy your parrot, but there is one more thing to do before we take that step - read up about the subject and talk to other bird keepers. There are many excellent books available about bird keeping, and if you have actually chosen a particular pet there are some devoted to single species. Reading and talking to people who have been through it before can help avoid some of the easy mistakes and pitfalls that can occur in aviculture. I repeat what I said earlier do not just buy a parrot on impulse as you pass a pet shop window, but then anyone who is likely to do that is not going to be reading this article in the first place. 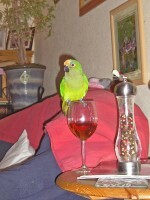 Suggesting specific breeds here can only be a personal opinion, and other advisers may think differently, but if your desire is for a single hand tamed pet, then you are best to go for an English bred (E/B) preferably hand reared (H/R) bird; it is still possible to tame an older bird but it is obviously more difficult. English bred birds are already adjusted to our climate and weather conditions, and are generally fit and healthy; although we have had occasional instances of dietary problems resulting in liver and kidney damage, if too much protein is fed in the early rearing mix. An African Grey parrot will make the best talker, although a young Amazon parrot can talk well and will be very playful and entertaining. Cockatoos will also speak well, but if hand reared will be the most demanding of human attention, and can develop all sorts of neuroses if their requirements are not met. The larger species such as Umbrella and Moluccan Cockatoos are also extremely noisy. If, however, you are looking for potential breeding birds it would be more sensible to opt for older stock, but in all cases ensure that it is healthy. Other varieties are described in Colin Scott's article 'Complete Beginner's Guide'. So, at last, having decided that you really can keep a bird properly, and have chosen a suitable species, where do you go to get your pet? There is a choice of a friend, a bird breeder or dealer, advertisers in magazines or journals, or a pet shop. If you are lucky enough to have a friend who has introduced you to bird keeping, and who perhaps has some surplus stock, then you will know the birds and their upbringing. You will know how they are fed and housed, and can ensure that there is no dramatic change in husbandry which could stress the bird. With a bit of luck you will also have a friend on hand who will continue to give you advice and support as you progress in bird keeping. Personal or commercial adverts in journals such as the Parrot Society Magazine will often produce just the bird you are looking for; alternatively the local pet shop may have a suitable candidate, or will be able to obtain your choice. One should be able to talk to the vendor about the bird and its requirements. Beware the pet shop perhaps recently involved in bird trading, where staff know nothing about the species they are selling. If one can talk to an assistant who keeps such birds themselves, one can be sure that their discussion will have some fact and basis on personal experience. A shop that labels its cages not just with a price ticket, but also some information about scientific and alternative common names, natural habitat, and dietary requirements is likely to be a better choice. I have seen some premises where labelling goes further to describe the advantages and disadvantages of each bird (such as - 'messy feeders', 'extremely destructive', or 'very noisy'). Such traders are genuinely concerned that the birds they sell are living creatures and not just decorative merchandise, and they will make every attempt to ensure that the animal you choose will be suitable for your needs. If you answer an advert from a supplier at the other end of the country, please try to visit the bird to check it before purchase and to transport it home. It never ceases to amaze me how people will spend vast sums of money on bird(s) which they have not seen, and have them despatched by rail or courier. This is not only stressful for the birds, but also means that you are buying something which may be not what you expect. Any reputable supplier should provide a money back or exchange facility on your bird for a reasonable period after purchase. This may be because the bird you choose turns out not to be suitable for your requirements, and you should not then be forced to hang on to something which is not right; or the animal may develop signs of disease soon after purchase. Even an outwardly fit and healthy bird can carry various organisms, and these may multiply and cause illness if the bird is stressed. 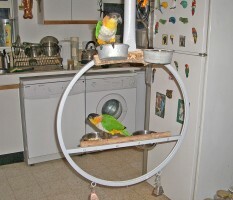 Parrots are comparatively delicate creatures, and any change of environment or routine can stress them sufficiently to lower their resistance to infection. Many retailers now offer the facility for the purchaser to have their purchase checked by a Veterinary Surgeon within a specified time, to ensure that such possible problems are not incubating. Hopefully you will now have been able to choose the right bird(s) for you and your household, and have found a helpful and knowledgeable supplier who will continue to offer support in the future. Established mature birds do not have excessive problems with illness, but nevertheless it is wise to make contact with a Veterinary Surgeon who has some experience with birds before trouble occurs, since these creatures need attention very quickly if they do succumb to disease. Enjoy your new relationship with your bird and the start of a probable lifelong hobby.